The Assisi Loop® is an FDA cleared Non-Pharmaceutical Anti-Inflammatory Device (NPAID®). It is a proven first-line and adjunct therapy for managing persistent pain and inflammatory conditions that impact health. The tPEMF® technology of the Assisi Loop has been demonstrated through laboratory testing to have a proven effect on the known biochemical and cellular mechanisms of action related to inflammation, with results published in peer-reviewed journals. When the complications of standard treatments narrow therapeutic options, vets prescribe the Loop. Please contact us today if you would like help finding a veterinarian, Assisi Loops are available by prescription only. Orthopedic Injuries: Strains or sprains, torn cruciate, blown discs, fractures, muscle strains and broken bones. Wound Care: Infected wounds, chronic non-healing wounds and lick granulomas. Other Inﬂammatory Issues: Pancreatitis, cystitis, tracheal bronchitis and laminitis. Post-Surgical Pain and Swelling: Following amputations, tooth extractions, tumor removal and ACL repair. 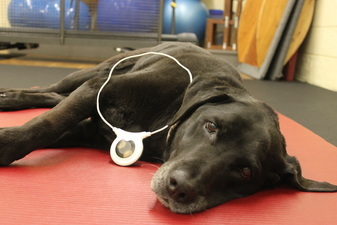 Contact us for information about the Assisi Loop 2.0 and whether or not it would help your pet. Visit assisianimalhealth.com to learn more. Many people are familiar with PEMF, since it has been in human use since the 1970’s to heal non-union fractures. Although products manufactured by Respond Systems are not for human use, Bio-Pulse PEMF systems have been in use for over 30 years on horses, dogs, cats and even elephants and giraffes! PEMF uses pulsing magnetic fields, developed by pulsing a small amount of battery current through coils of wire, to initiate normal biological cellular reactions that result in improved circulation and provide pain relief. PEMF has the unique ability to pass through fur, skin, bandages and bone. 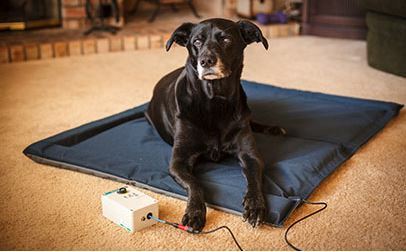 The depth of field of Respond Systems Bio-Pulse PEMF Small Animal Bed can penetrate through the entire body of a dog lying on the bed reaching deep into the joints and muscles stimulating circulation. The beds can be placed on the couch, in a crate, under your dog’s bedding or even in the car. The 30-minute treatment cannot be felt but the effect is noticeable and many times your pet will relax on the bed or even fall asleep. Typically, you will see results within two weeks and many times you will notice an immediate difference in the way your pet rises, walks and runs.